The Zonta Club of Manawatu was chartered on the 14th August 1975, and has been active and thriving for the last 40 years. The 1970’s was a time when a number of new Clubs were being established throughout New Zealand and Zonta International was growing quickly as a new organization for business and professional women. The Zonta Club of Wellington had chartered a few years earlier, and they were instrumental in sponsoring the charter of the Manawatu Club. In turn, Zonta Manawatu was able to support the charter of the Wanganui Club a few years later. The President of Wellington Club at the time was Dame Margaret Sparrow. Margaret chaired the very first meeting of the Zonta Manawatu Club. The charter president of Zonta Manawatu was Robyn Leeming, an academic and soon to be city councilor. The club formed with 34 charter members drawn from a broad spectrum of the community. 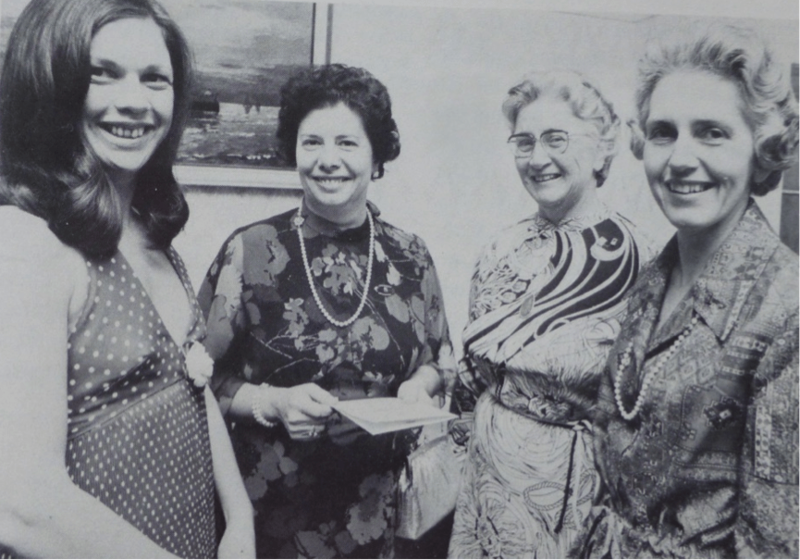 The charter dinner was held at the Convention Centre in Palmerston North on 23rd September 1975, and attended by community and Zonta representatives, including Miss Eleanor Jammal, International President of Zonta International at the time. Eleanor was from Ohio, USA, and travelled here after the District Convention in Australia. The only place she stayed overnight in NZ was in Palmerston North. Quite an honour! During the early years Zonta Manawatu was active in community service, and high profile fundraisers were directed to community projects. As a consequence, Zonta Manawatu became well known and club membership numbers grew quickly, peaking at more than 40 in the first decade. Records from this time seem full of news clippings about fundraisers, and their beneficiaries, and photographs of fellowship activities, usually centered on food, fellowship and fun. Shows, annual Christmas Cocktail Party and Craft Fairs. More recently these have taken the form of very successful biennial Garden Rambles. Zonta Manawatu has always been active and an enthusiastic advocate for women’s issues, and developed overtime a somewhat unfair reputation for seriousness. As the Club matured in the mid-­‐80’s, there was increased focus on the Zonta mission of advancing the status of women worldwide. This led to greater emphasis on service and advocacy activities that directly contributed to this mission. The Club actively supported Zonta International Foundation projects, and were donors to key projects of the time e.g. Water Wells in Sri Lanka in the early 80’s, and has contributed financially to the Zonta International Foundation service projects every biennium since then. Zonta Manawatu has a history of local awards and scholarships. A Clothing Design Award for young students in the Manawatu region ran for many years with sponsorship from Bernina; undergraduate award in Nursing Studies at UCOL named in honour of club member Emeritus Professor Norma Chick and her considerable contribution to nursing in New Zealand; and a post-­‐graduate award at Massey University were offered throughout the 80’s and 90’s. Zonta Manawatu actively supports the Zonta International global awards, specifically YWPA Award and Jane M Klausman Women in Business Award. We are proud of the fact that Club nominees for the JMK Awards secured success at national and international level in three consecutive years -­‐ 2009 to 2011. Today, Zonta Manawatu now also offers a travel award for a woman completing a PhD in Science and Technology at Massey University. This award is generously sponsored by the Graduate Women Manawatu Charitable Trust with whom we have an important collaboration. Annual books prizes for prizegiving, and other support, have been provided to our local Teen Parent School since its establishment in 2003. Over the 40 years since charter date, a number of members have served at senior positions within Zonta International, and rendered considerable service to both the Manawatu Club and to the wider organisation. These include; Susan Laidlaw, a well know broadcasting personality, and former Manawatu club president served as District Governor D16 in the 80’s after her relocation to Amberley in the South Island where she transferred to the Waimakariri Club. Jean Corbin-­‐Thomas, QSM, was elected as Governor of Zonta International District 16 in 1998-­‐2000. Jean’s professional background of teaching history and classics, and broad interests in women’s issues and community, provided considerable depth and experience to this role. Jean continues to be an extremely active club member as well as pursuing her interests and commitments to voluntary committee roles as diverse as justice, and the arts. Anne Walker was elected Governor of Zonta International 2008-­‐2010. Anne’s long time senior management experience, combined with a deep commitment to women’s issues, provided a broad strategic perspective to the development of Zonta International within New Zealand. Both Jean and Anne served on Zonta International Committees subsequent to their Governorships. Club members have also held other district office, for example -­‐ Gill Green – District Secretary during Jeans’ governorship, and Anne Weir during Anne Walker’s. Members Fiona Green and Doreen Creamer co-­‐chaired the YWPA Awards in 2002-­‐2004. Margaret Knight chaired the Advocacy and Legislative Awareness Committee 2006-­‐2008. Members of Zonta Manawatu are today represented in the governance and membership of organisations as diverse as UN Women, National Council of Women, New Horizons for Women Trust, NZ Federation of Graduate Women, Graduate Women Manawatu Charitable Trust, Manawatu Women’s Refuge, among others. Zonta Manawatu has a broad and effective outreach. Club activities routinely combine advocacy and service. Zonta Manawatu has hosted the International Women’s day (IWD) breakfasts each year for as long as many of the club members can recall. This is an annual highlight with high profile speakers and attendance numbers exceeding 120 every March 8th. The Club also sponsors attendance of young women leaders from local high schools. Elliot Foundation on a very successful speaking tour of local High Schools in the years before this became a D16 project. Toilet bags prepared each year for the Women Refuge which must now number in the 1000’s donated over time. Zonta breast cushions to help women post-­‐surgery have been prepared at a target rate of 100 per year since starting this project in 2007. Every year Zonta Manawatu support a local Club project. Currently this is supporting “Women in Art”, an art and wellbeing initative for former refuge clients. In summary, in over 40 years since charter, Zonta Manawatu has become well established within the Manawatu local community. Membership goes up and down as members come and go over time, but invariably sits at around the healthy 20 plus mark. Zonta Manawatu has history of service and advocacy of which we should be proud, and determined to continue.